You are here: Home / Being Human / Better Being / Mind full? Get mindful. Mindfulness, what does it mean? Mindfulness touches on concepts related to our awareness and presence in every day life. Additionally, it deals with the placement, and quality, of our attention and focus within every moment. In essence, mindfulness gives us a way to be present in life, to be aware and to go beyond our typical state of being, lost in thought and cruising on autopilot while life passes by. 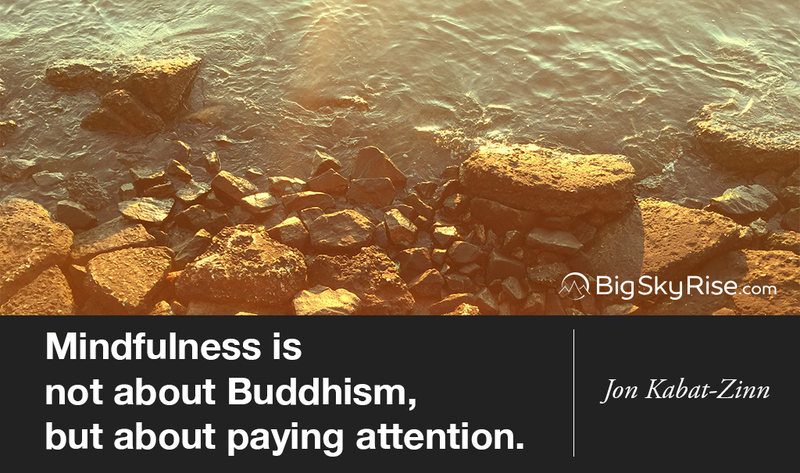 Or, as Jon Kabat-Zinn phrases it, mindfulness is awareness that arises by paying attention, on purpose, in the present, non-judgmentally. Being aware on purpose and in a nonjudgmental way are important keys in approaching mindfulness. These factors help us achieve a level of clarity, calmness, and deeper awareness than we can otherwise find in our conventional experience of awareness. So, what’s mindfulness all about? It’s about interacting with each moment through an active state-of-mind so that we are fully in tune with the life we are living. Being mindful is about knowing, understanding, and experiencing our thoughts, emotions, feelings, environment, and self. Mindfulness really is about a great many things, and perhaps, in a sense, it’s even about everything. The impacts of mindfulness are far-reaching, life-changing, and world-altering. While world-altering might sound far-fetched, or like a fanciful exaggeration, learning about and engaging with people whose lives were altered through the cultivation of mindfulness can be eye-opening. The stories of Gary, Deb, or Dr. MacLean from The Atlantic’s How Meditation Works are magnificent examples of the range of people and situations mindfulness can impact. Each person’s challenges and life story are unique, while at the same time there is a core that ties us all together. Gary is a burly and tattooed recovered addict. Deb is a mother of two diagnosed with Stage III breast cancer. Dr. MacLean is a psychologist at the Johns Hopkins University School of Medicine who faced panic attacks from a strong fear of death. Each one discovered and came to practice mindfulness through a very different course and for very different reasons. All three found a very helpful tool that altered their life in remarkable ways. There’s also the story of Andy Puddicombe who has encountered great tragedy, lived as a Tibetan Buddhist monk, and taken up a degree in Circus Arts, among many things. Mindfulness and meditation is such a major factor in his life that it has lead him to start Headspace, a startup whose meditation app now touches millions of lives. These are just a handful of stories and they already illustrate the impact of mindfulness on very different people with very different situations. As the number and variety of powerful stories like the ones mentioned above grow, the level of attention mindfulness receives is also growing. With this attention, the question of what it takes to be mindful comes up. Simply put, being mindful takes practice, and is something that is cultivated over time. The great news is that anyone can get on the path towards greater mindfulness, and there are many entrances to this path. Simply by asking ourselves “what are my thoughts, how can I be more mindful and more present”, we are moving along a path towards greater mindfulness. From this point, there are many possibilities for cultivating greater mindfulness. While sitting motionless, meditating, in a quiet space, for a set period of time every day is very beneficial, it isn’t the only way to get on the road to mindfulness. There are many simple exercises that can help cultivate a mindful state. Some take only moments to do, some can be done while doing normal every day activities like walking, and some take nothing more than setting up some form of reminder. Regardless of the method used to gain a more mindful state, it is important to take it slowly, naturally, without judgement, and in a way that works on an individual level. There is no need to force it, and in fact, trying to force it is often very counter-productive. Additionally, instead of trying to control or prevent thoughts, feelings, and emotions, being mindful is about learning, understanding, discovering and when appropriate letting go of them. In the same sense that life is a journey and being is about experiencing and enjoying that journey, being mindful is also about the journey and process. Approaching a journey into mindful living with clear expectations helps to enhance its effectiveness and lessens the chances of encountering unnecessary barriers. Appreciating that living in a mindful way is a process that takes time and is a journey in and of itself is an excellent place to start. When we approach the exercise without judgement, expectations, forcefulness, and are willing to let go of things, cultivating a mindful state becomes easier. Additionally, it is helpful to recognize that being mindful doesn’t eliminate the pressures, difficulties, or challenging events we face in life. What mindfulness provides for us is a way to change our relationship with these situations. Also of importance, living mindfully, being in the moment, and being present, still allows for time to let the mind wander, to daydream, to think, and to be creative. Furthermore, it can make doing these things even more powerful as doing these things in a mindful way means we approach them with awareness and freedom. Approaching mindfulness with fresh eyes and by getting rid of prior assumptions is important. Mindfulness is about being present and aware of our thoughts, feelings, sensations, and environment. It is about being, is very powerful, and has deeply touched the lives of very different people in very different circumstances. Each of us can practice and cultivate a more mindful life, and there are many ways to do it. For best results, approach a mindfulness practice with clear, unbiased expectations. Being mindful is about finding happiness, and happiness is something to be shared. This post and all of BigSkyRise are here to make lives better. Please, considering sharing with the people you care about. Plus, journeys are more marvelous together. Thank you!